This month’s #BostikBlogger theme is birds and flying. 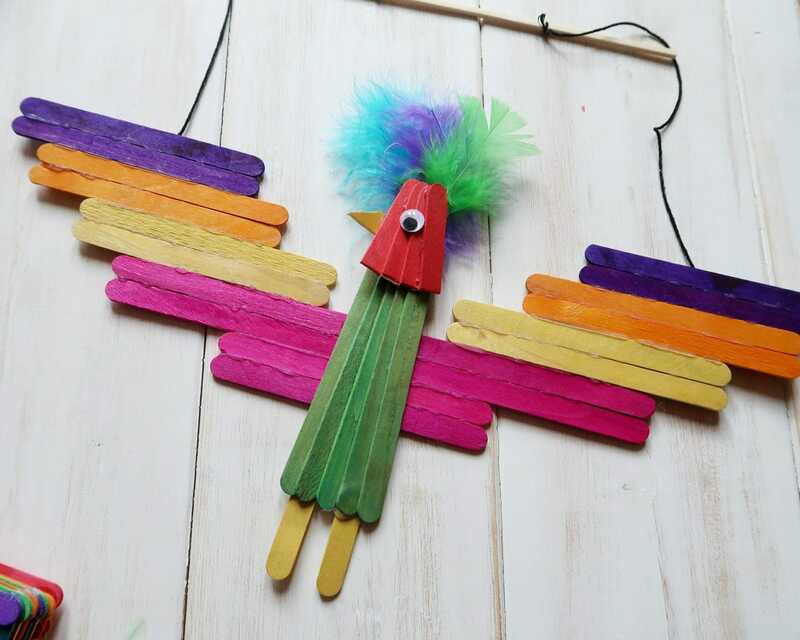 I have built up a fair collection of multi-coloured lolly sticks over the last few years, and so I decided to create three different bird crafts with them. 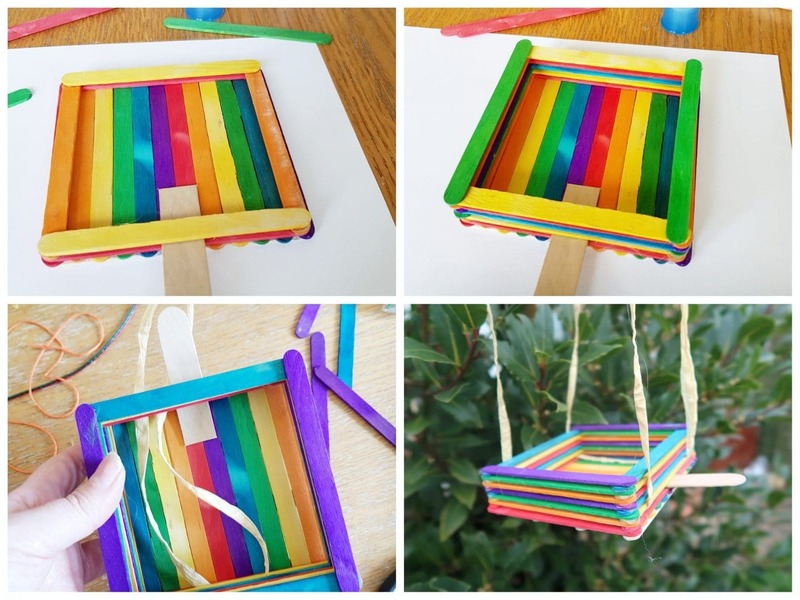 Below, you will find instructions on how to make these rainbow lolly stick crafts – a bird-feeder, a hanging parrot and a clothes peg peacock. The bird-feeder is a great addition to the garden and provides a great opportunity to watch for birds. The parrot and peacock are also great fun to play with and make bright decorations too. You may have seen on the news – due to all the unprecedented snow, birds are suffering a bit right now. This lolly stick craft is so easy to do and results in a lovely bird-feeder than you can hang in the garden in order to help out our avian friends during this difficult time – just add bird seed. 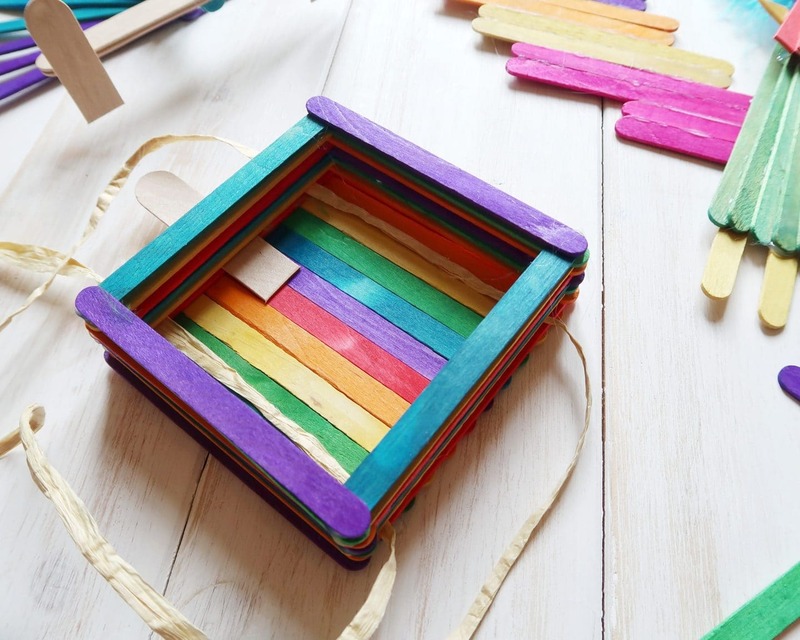 For this lolly stick craft, start off by arranging your lolly sticks on a flat surface so that they form a square shape. Next, use four additional lolly sticks and glue them down running the opposite way to the square of lolly sticks, spaced evenly apart. 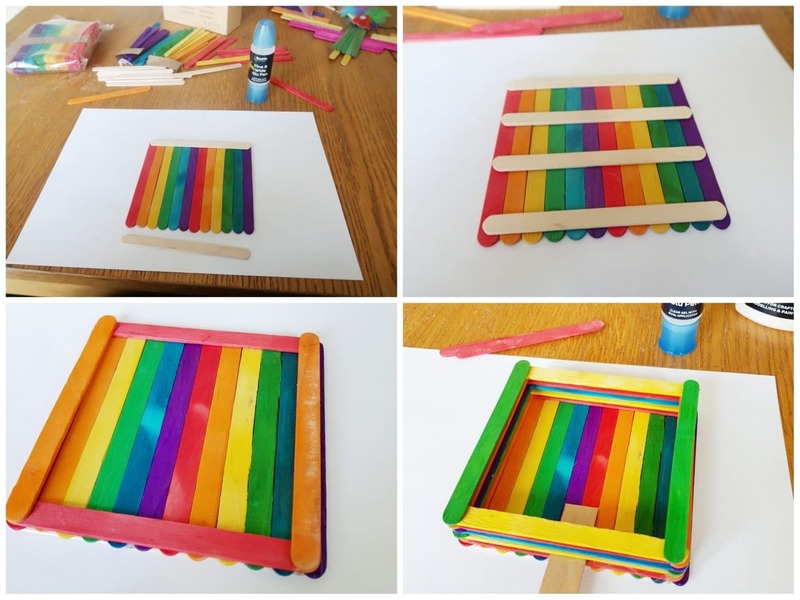 Turn the square over so that the side without the bracing lolly sticks is showing and build up lolly sticks in a box shape. You simply need to add a spot of glue in each corner and build the sticks up. When you have a layer of one or two sticks in place, add a piece of lolly stick to act as a perch, sticking out from the rest. Once you have built up enough sticks to hold a good amount of seed, wait for the glue to dry. Finally, add string so that you can hang your feeder. You can thread it through the slats formed by the sticks at the bottom of the feeder. Then, tie off at the top and add seed. You can hang your bird feeder from any likely branches in the garden. 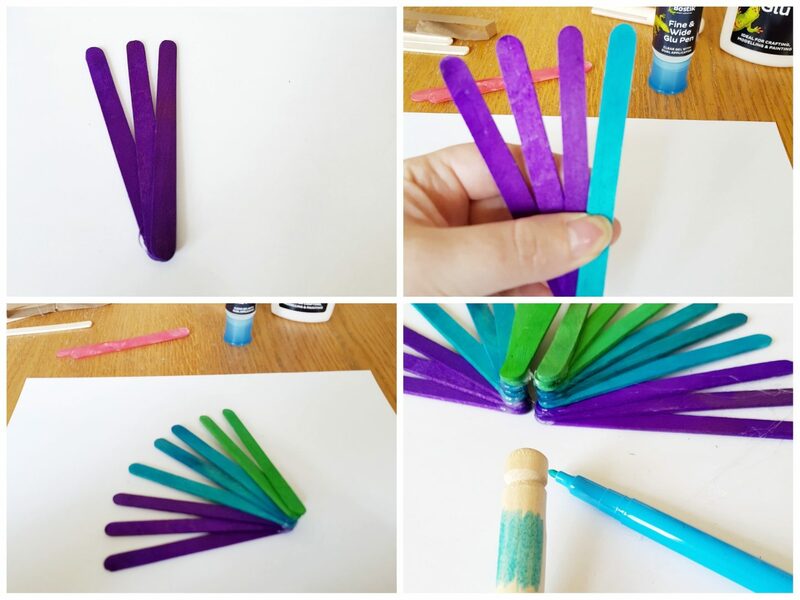 Create a fan of purple, blue and green lolly sticks in a pattern, as shown above. Place glue at the bottom end of each stick and build them up in a fan shape. I split mine into two symmetrical halves and then glued the two halves together. 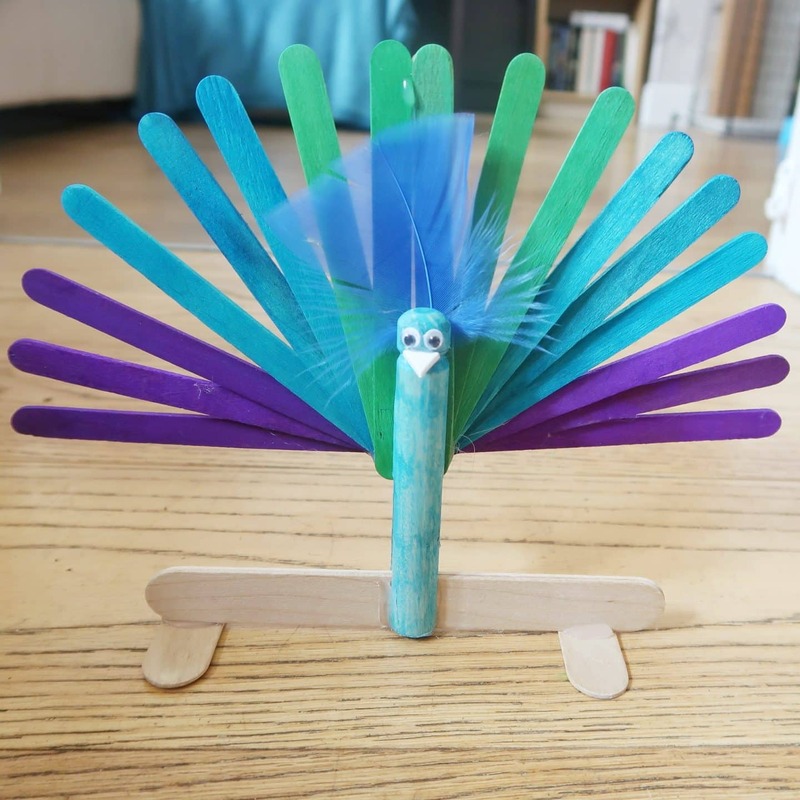 Next, prepare your clothes peg by painting or colouring it, drawing or adding googly eyes and adding a small triangle or card or foam for a beak. Finally, I stuck a blue feather to the peacock’s head. Glue the peacock body to the fan-shaped tail. I also added a perch for my clothes peg peacock. I simply glued some plain lolly sticks together and used two smaller pieces of lolly stick to create ‘feet’, meaning the perch stands up. Firstly, stick pairs of lolly sticks together side by side so that you have nine pairs to make the wings. You need three of one colour (pink on mine) and two of each other. 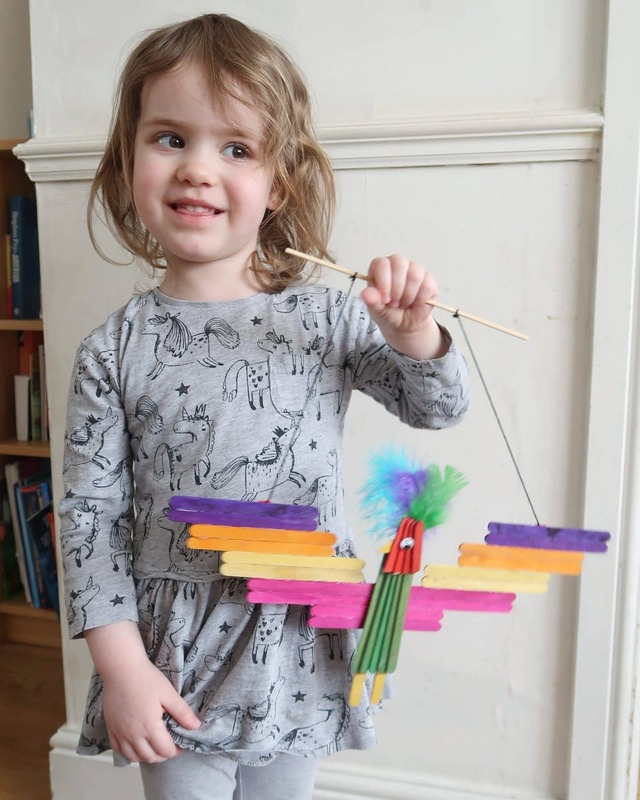 Next, glue them together to make a bird wing shape, a bit like the letter V.
Once the wings are dry, use one colour of lolly sticks to make a head and body shape. I used four whole green sticks for the body and four pieces of red lolly stick (trimmed smaller with scissors) to make the head. For each, I fanned the sticks out slightly and glued in place to get the body and head shape I desired. I then added two smaller pieces of yellow lolly stick for feet, an eye and craft feathers on the head. If you want to, you can add string to each wing and/or a small piece of wood in order to hang the parrot as a decoration. 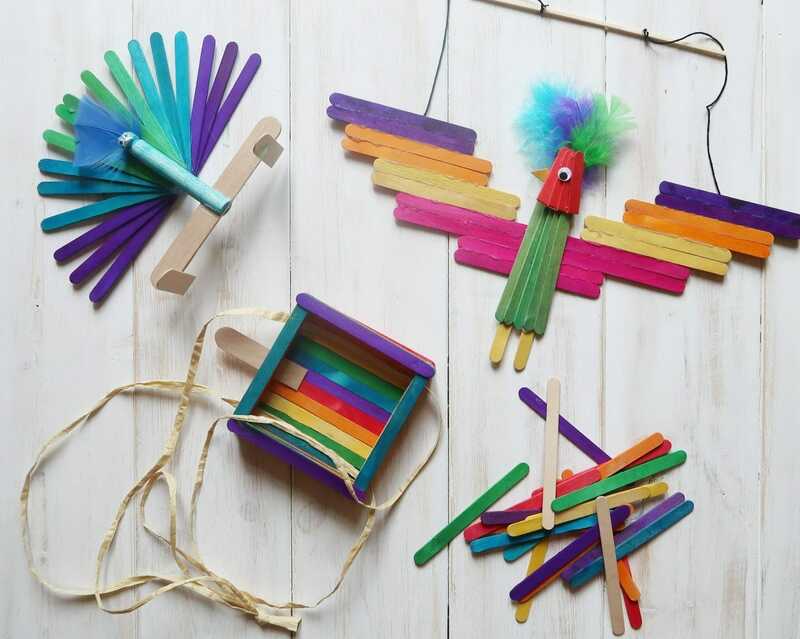 And there you have it – three lolly stick crafts to brighten your day and keep the birdies happy. 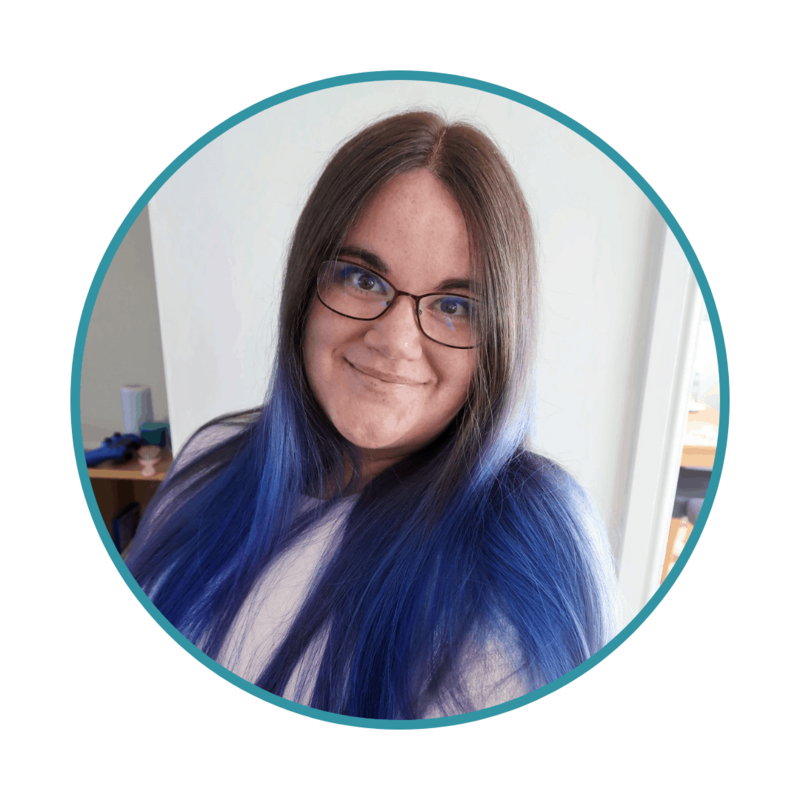 This post contains affiliate links which means if you click through and buy something we may earn a small comission at no cost to you. Bostik send us a range of craft materials each month in order to create the themed monthly crafts.